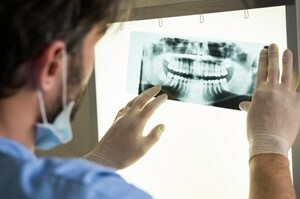 Wisdom teeth are renowned for causing problems in teenagers and young adults. Surfacing much later than all other teeth, they are the last four teeth to emerge in the mouth and are located at the very back of the upper and lower jaws. However, by this time there is often insufficient room left along the jaw for wisdom teeth to emerge properly and position themselves correctly. A common complication of wisdom teeth is when they become impacted, which means they grow sideways. This places pressure on the surrounding bone structures and teeth, causing pain and discomfort, as well as altering the positioning of other teeth. Other problems related to wisdom teeth include tenderness, swelling, gum disease, cysts and other oral issues. When this occurs, the only treatment is to extract the wisdom tooth, or a number of wisdom teeth, found to be at the root of the cause. In many cases, wisdom tooth removal will be a similar procedure to that of any other tooth extraction. The dentist or oral surgeon will numb the area with local anaesthetic before starting work. If you have more than one tooth to be removed, or if the surgery is in any way complicated (for example, if the teeth are already impacted and infected), you may be given a general anaesthetic. This will put you to sleep for the duration of the surgery. In this case, you won’t feel anything during the procedure and will wake up after it’s finished. Once the tooth or teeth have been removed, the surgeon will use stitches to help the wound heal. Many professionals use dissolvable stitches that naturally disappear after a few days, while others may use stitches that need to be removed. Your dental professional will advise you on which type you have. What do I do after I’ve had wisdom tooth removal? Directly after the surgery, you will need to rest and take it easy until the effects of the anaesthetic have worn off. If you have had a general, you will need someone to drive you home afterwards. It’s likely that any wounds will continue to bleed for a little while, so it’s possible that we will need to leave cotton pads in your mouth. Once you remove these pads, it’s important to avoid chewing with that area or touching it with your fingers or tongue. At this stage, it’s best to simply let it heal. This includes brushing your teeth; even though it’s important to continue good oral hygiene practices on the rest of your teeth, you don’t want to risk opening the wound or pulling the stitches out with a brush. You may experience swelling or bruising around your jawline after the surgery. To help with this, you can gently place ice packs against your cheeks. In case of pain in the days following, your dentist may also suggest anti-inflammatory painkillers to ease any discomfort. However, you generally won’t need anything stronger than what you can purchase over the counter. If bleeding persists for more than 24 hours or another issue occurs, contact us as soon as possible. Our team will fully brief you on what to expect before and after the surgery, so be sure to follow any instructions for the fastest possible recovery. If you or your child are concerned about your wisdom teeth, or are experiencing any symptoms, call us today to book a consultation to discuss your options and what’s involved.